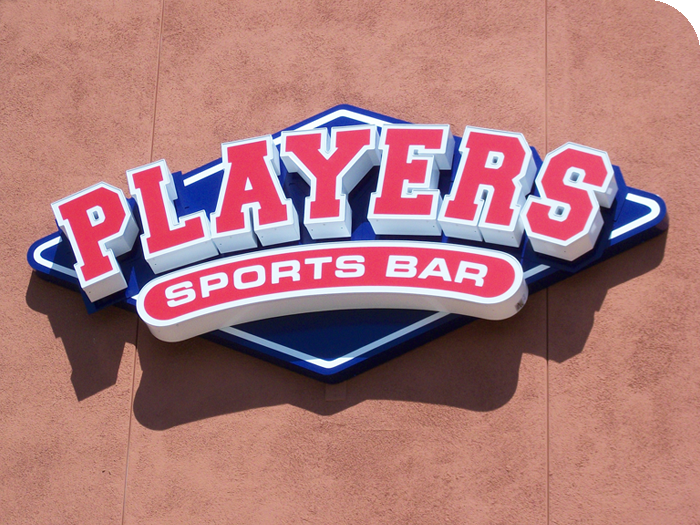 Players Sports Bar opened its new second location in San Marcos, California in July, 2011. When the original Players Sports Bar in San Diego, CA was purchased (now closed), the existing signage had an outdated logo on the building. This had been used on all collateral by default. With the opening of the new San Marcos location, investment in new signage, menus, business cards, and many other applications warranted a refresh of the outdated logo, while still echoing the original logo shape. With every sport imaginable broadcast on their many large screen televisions, the colors demanded sporty red and blue! This inherited previous logo (now retired) was on the exterior of the original location in San Diego, which closed December 2014. This new Players Sports Bar logo was redesigned prior to opening their second location July 2011 in San Marcos, CA. The new Players Sports Bar logo was hand-painted to their newly remodeled floor. View this application at their San Marcos, CA location.